The MBA’s annual 2016 conference kicked off yesterday and continues through Wednesday of this week in Boston, MA. Mortech is exhibiting, and if you happen to be there as well, we’d like to see you there. However, we also wanted to let you know what we’ve been up to recently. Our team has been hard at work innovating and integrating, with the goal of providing our users with the best tools and software to do their job quickly and effectively, with the most accurate and up-to-date mortgage data available. This mindset has led to some pretty exciting advancements lately, and ones that we’re happy to show you. Mortech has long understood that the best way to provide the right tools for our users isn’t necessarily to try to reinvent them. That’s why we’ve never shied away from integrating with companies that can help provide the best user experience for lenders and borrowers alike. This can mean integrating with a company like Daric, who provides a Point of Sale and application automation tool that improves application processing time as well as lead conversion. Daric’s software makes life for your borrowers better, and in turn, makes things quicker and easier for you. It can also mean improving your audience and the data you provide them. 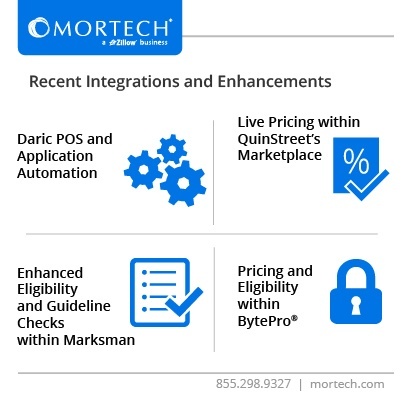 By integrating our live pricing functionality with QuinStreet, Mortech can now supply live, accurate, updated rates as soon as changes occur to lenders advertising on QuinStreet’s online marketplace. This prevents the thousands of online mortgage shoppers visiting QuinStreet on a daily basis from seeing old, outdated rate information, and improves their overall borrower experience. Marksman quote services also makes it easy for lenders to view rates as well, with all of their investor rates conveniently on one page in the system, so that not only your borrowers are seeing the most accurate rates, but you are as well. Other times, an integration isn’t about what your borrower sees, but what you see, and what you can do on your interface. For example, our integration with Byte software provides Marksman eligibility and loan pricing information directly within BytePro’s interface, meaning that you don’t need multiple screens to view and manage eligibility checks outside of Byte’s LOS. This eligibility information, by the way, is something that Mortech enhanced earlier this year, and is now better than ever at checking loan scenarios and providing lenders with proper feedback when checking a borrower’s eligibility. Do these integrations make you as excited as they’ve made us? Well then let us talk with you today, and teach you more about how these integrations can improve your business, saving you time, and providing the best user experience for your borrowers. Schedule a demo with us today, or if you’re in Boston for MBA Annual, stop by booth #508 and chat with us (and pick up a little free swag, too).